The complete system (projector, data source and HoloScreen) is a simple economical display that can provide advertising in various continuity modes that will attract and draw people to the promotional area. All it takes to change the promotion or product service presentation is to change the programmable DVD, CD or Digital Network Signage System Processor rather that continually replacing one-dimensional graphic signs. Revenue generating opportunities can be realize by renting advertising time to clients or vendors. Seeing innovative new products, for Oscar de la Renta or NIKE jump out of thin air on a Holo ProScreen would be a sensational way to introduce new fashions, cosmetics, automobiles, cellular phones, art, computers, general information directories, maps, schedules. You name it—the list is endless. The thing most cruise ship patrons ask is “What’s going on with the Holo ProScreen Air Show System?” The patrons can hardly keep their eyes off the information or highlights of events. 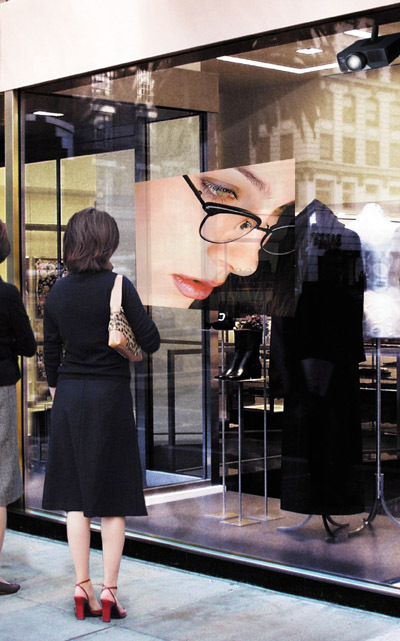 For more information visit our transparent digital signage page.